Adam Lambert IG PHOTO: Vegas Baby! @officialqueenmusic @parktheaterlv #thecrownjewels custom purple leather jacket designed by @ashtonmichael !! @adamlambert: Vegas Baby! @officialqueenmusic @parktheaterlv #thecrownjewels custom purple leather jacket designed by @ashtonmichael !! Vegas Baby! @officialqueenmusic @parktheaterlv #thecrownjewels custom purple leather jacket designed by @ashtonmichael !! Appropriately Royal Purple! And not lacking in zippers! Has anyone else noticed that the partially unzipped zippers at Adam's waistline go all the way around? That means that the bottom part of the coat must be able to be entirely removed so as to make a short jacket! Will wonders never cease? Yeah, I just saw that. Adam's outfits look like they cost a bundle. Really rich fabrics, custom fit and styled. He looks like a million bucks. 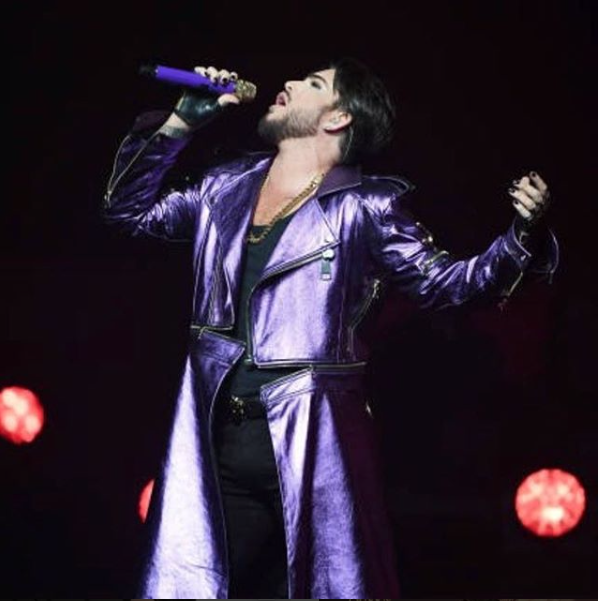 Dee R Gee...Just thinking...I wonder if this coat, and other costumes and clothing of Adam's might come under that contract he has with an advertising firm....when he specifically identifies the item by designer. Maybe then he gets things free, discounted, or is paid a fee for wearing it.